We’re all trying to do more with less these days. And for those working or volunteering in membership and non-profit organizations this can often mean wearing many hats and juggling competing priorities. So when we asked small-staff and volunteer-led organizations the key challenges they are facing, we weren’t surprised that limited resources and high volunteer turnover ranked high on the list. At Wild Apricot, we wondered how we could help (in addition to offering this blog and our Membership Management Software). We decided that providing information and resources to the staff, board members and volunteers of small membership organizations might help them with their new roles and day-to-day challenges. And while we provide membership tips, ideas and insight in this blog, we wanted to take it to the next level and offer more in-depth, actionable resources. 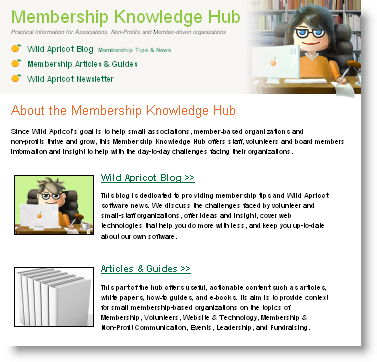 Wild Apricot is pleased to launch our Membership Knowledge Hub. This online resource center offers articles, white papers and how-to guides on topics including: membership management; communications planning; volunteers; event management; technology and websites; leadership and fundraising. In addition, our Hub offers curated articles, e-books and other resources on topics such as volunteer management, fundraising and leadership from knowledgeable industry sources, such as Idealware, the Melos Institute, Network for Good, Volunteer Canada to name a few. You may be a volunteer taking on a new communications role; or are in charge of developing a new event and need some guidance to get started. Or you’re a staff person responsible for updating your membership database and you’re wondering where to turn for information. You can now check out the Membership Knowledge Hub resources for practical information through its articles, guides and e-books. We hope our Membership Knowledge Hub becomes the “go-to” web destination for helpful articles, guides and how-to resources for small associations, non-profits and other membership organizations. Membership Knowledge Hub resources can be viewed or downloaded free-of-charge simply by visiting: https://www.wildapricot.com/articles/. Bookmark this link and visit often to check out new resources that will be added frequently. You can also subscribe to the Hub and we’ll send you email updates when new resources become available. So check out Wild Apricot’s new Membership Knowledge Hub and let us know what you think in the comments below.